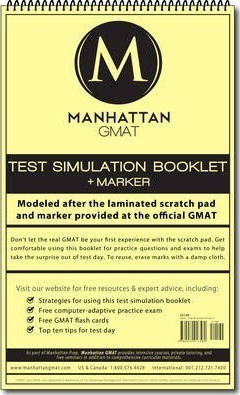 This unique product gets students comfortable with the GMAT's laminated scratch paper and special marker, a disconcerting feature of the actual test. This unique product gets students comfortable with the GMAT's laminated scratch paper and a dry-erase marker, a disconcerting feature of the actual test. This essential preparation tool helps you become comfortable with the laminated scratch paper that you'll use on an Official GMAT. The Test Simulation Booklet consists of five laminated double-sided pages and is virtually identical to the booklet provided at official GMAT testing centers. Also, included is a non-permanent marker similar to the one used on test day for thin and accurate lines. You can erase your work using a damp paper towel.